Stage 1: Nitric Oxide (NO) diffuses into the smooth muscle cell where it activates the enzyme Guanylyl Cyclase (GC) causing an increase in the synthesis of Cyclic Guanosine Monophosphate (cGMP), which acts to regulate various metabolic processes in the body. Stage 2: cGMP is then broken down by PDE5, an enzyme found in smooth muscle that can negatively affect your ability to get the best pump possible. It's at this stage in the complex NO biochemical pathway that regular L-Arginine-driven NO products drop the ball – they simply fail to address this NO inhibitor that restricts NO production. This is where the proprietary ingredient HYPEROX, which can only be found in new MUTANT PUMP, comes in to play. Stage 3: In combination with L-Arginine, MUTANT PUMP has been able to push NO production past all previous limits with its exclusive ingredient HYPEROX. In fact, HYPEROX is so strong that it works quickly to blunt the activity of the PDE5 enzyme and allows cGMP levels to increase substantially. Stage 4: The powerful cGMP molecule promotes a cascade of biochemical events that result in greater smooth muscle relaxation, allowing you to finally harness the full power of NO for more commanding muscle pumps and to help trigger new muscle growth like never before. Directions: Take one full serving (7 caplets) up to 30 minutes before your workout. One month supply is based on 5-6 workouts per week. Do not exceed 7 caplets per serving. CAUTION: MUTANT PUMP is formulated to give you a muscle pump like you’ve never had before. 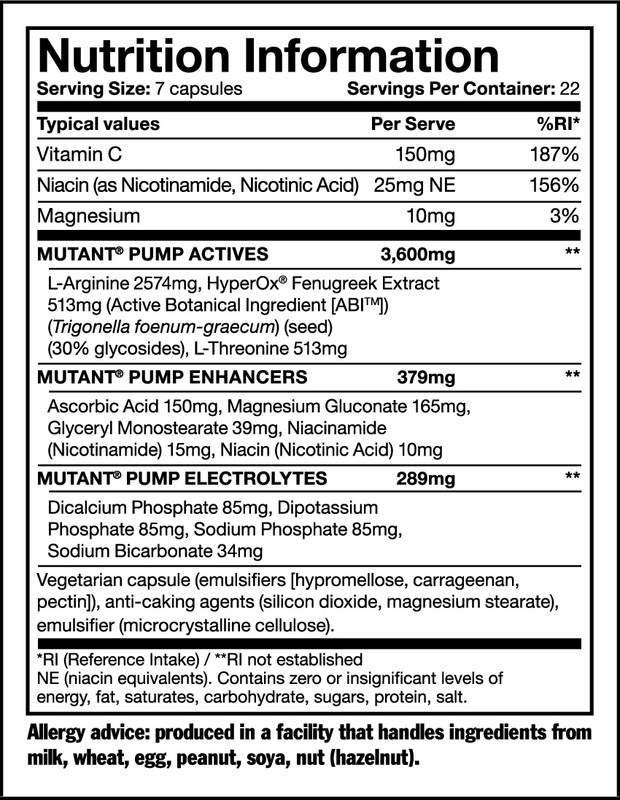 MUTANT PUMP contains the highest amount of the bioactive compounds per serving that will force a pump beyond belief. Therefore, do not consume more than the recommended serving. For best results, consume with 12 oz. of water and continue sipping water throughout your workout. 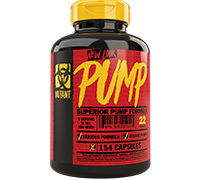 It is safe and recommended to stack MUTANT PUMP with other MUTANT products.